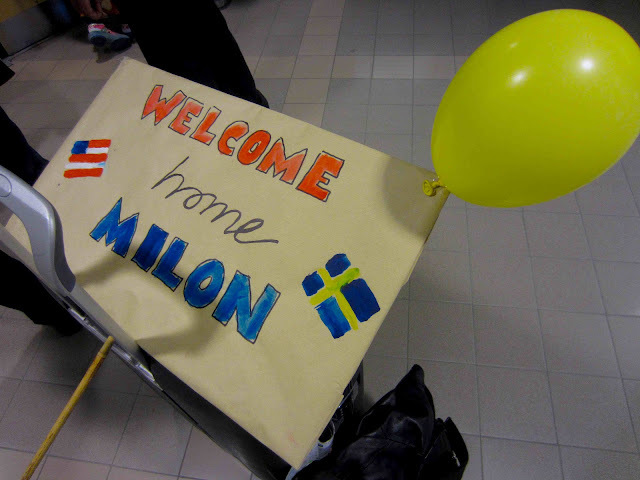 Milon in Washington DC: A new chapter of this blog. Let's call it Post DC Depression. A new chapter of this blog. Let's call it Post DC Depression. That thing about not crying when leaving DC worked out a little bit so-so. Almost a whole hour into the flight I just stared out through the window while sobbing, yet trying to be brave. The remaining six or so hours, I watched a few movies and my eyes filled up a little too easy during all the cheesy "I love you"-moments. Oh well. Some 24 hours after departure from American soil, I landed in my hometown and was greeted by one of my brothers, with the cutest baby in the world on his arm, a mustache on his upper lip and a welcome home sign in his hand. Thank God for good reunions when you just had a heartbreaking farewell. Ja, det var helt underbart att få krama dig! Om du någon gång har vägarna förbi Göteborg vet du vem du ska höra av dig till :) Kram! Du är saknad i Amerikat!!!!! Jag saknar redan Amerikat. Och kanske även den som står bakom denna hälsning?